To access the Arena system in Xeno Quest, players must reach a certain level and complete the main quest “Cavalier Arena”. 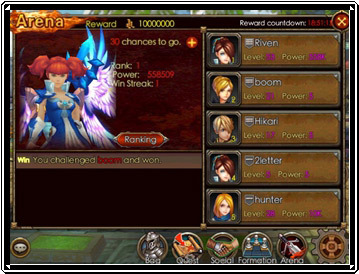 Once the Arena system is unlocked, players can click on the option “Arena” at the lower right side to enter its interface. There players can find the battle log on the bottom left. The power and hero rankings are at the top left. Battle log includes winning and losing logs. Power ranking consists of combat power and win streak. Hero ranking allows players to view all players’ ranks in the server. The right side of the interface is what we focus on. From here, players can view 5 players who rank higher than themselves and choose to fight them. Players are given 15 chances to join the Arena battle every day and are awarded Gold after winning the challenge. The Arena system will count up based on players’ ranks and send Gold and Training Pills for training. Moreover, the champion of the Arena will have a statue representing them. If s/he is defeated, the statue with change to the new victor.